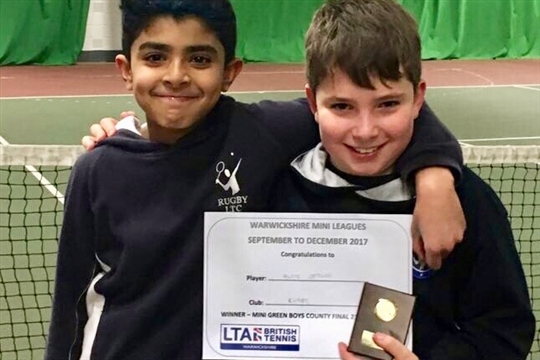 Alfie Offord and Raheem Shahzada, representing Rugby Lawn Tennis Club, came 1st out of 40 Warwickshire and Birmingham tennis club teams in the Warwickshire Mini Tennis League 2017-2018 for Boys aged 10 and Under . In a competitive finals day contested on 21st January 2018 indoors at Tudor Grange Leisure Centre in Solihull, Rugby beat Alcester 4-1 in the final. After winning their opening doubles match in decisive fashion, Alfie and Raheem then each won their opening singles matches to take an unassailable 3-0 lead. Rugby LTC Chairman Graeme Baker was present to witness their success, and was impressed that the boys had listened to his advice on playing doubles tennis and had implemented it 100%.